You can easily set the infuser your desired optimal height. The attached hook lets the ball hang from your teapot or panhandle and is easily removable when your herbs have fully steeped. Simply discard used leaves and rinse in water. Dishwasher safe, but it's recommended to wash by hand to enhance the life span of the tea strainer. Hang them on somewhere and they would dry in few minutes. 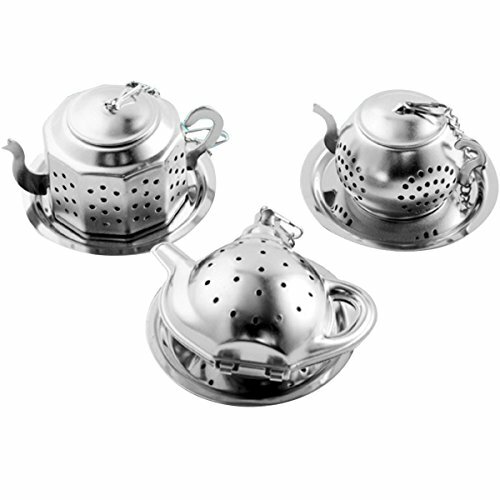 Tea ball strainers are essential for all tea lovers. They're a perfect gift for holidays and special occasions, especially if you bundle them up with a section of lose leaf teas. Bring your friends and family the pleasure of brewing their first fresh steeped and infused teas. Food grade stainless steel is non-toxic and rust resistant, providing years of enjoyment. Enjoy your favorite loose leaf tea without worrying about debris. Super fine mesh suitable for small size leafs. Lid locks in place with a simple twist. Tea debris stays securely inside, leaving your favorite tea pure and pristine. Suitable for medium to large tea leafs, NOT extra small leafs. Best size for single cup serving. Roomy enough for your favorite tea to expand and release their full flavor. Stainless steel drip tray is included to avoid spillage/mess and keep the area clean. Bonus tea scoop for easy filling. Lovely teapot-shaped infuser looks amazing, your families and friends will love it. The extended length chain comes with an easy to connect open mouth hook and weighted medallion to hold it in place. The tea strainer works well with most leaf teas including green tea, oolong tea, rooibos and some finer herbal teas. Reduces floaties and tea debris in your mug and unwanted leaves floating in your cup. If you have any questions about this product by Sherry US, contact us by completing and submitting the form below. If you are looking for a specif part number, please include it with your message.